I just found this while rereading Aramis, or the Love of Technology … the history of PRTs is just so amazing! This one was actually developed near my hometown in Hagen in the 1970s and should have been installed in Hamburg – but then was canceled. Aramis brother? This has been an interesting year for all of us at installingorder.org. We had a number of good topics this year and we are very happy that the blog is now way more interactive than it was before. We have been a little quite over the summer, sorry for that, but we are back since 4S 2013 in San Diego which was a great conference and a fantastic meeting for all who study societies sociotechnical nerves. Stefanie Fishel joined us, first as a guest blogger, then as full time author. Thanks for the great input, Stef! Next year will see guest bloggers again, starting with Andrzej W. Nowak from the Adam Mickiewicz University in Poznań, Poland. (See his TedXPoznan talk on youtube, sad that I don´t speak polish). We are looking forward to that! And there will be more! Expect 2014 to be as interesting as the last. For the rest of the year we will, as most of you will too, take a little break and rest over the holidays. Have yourself a merry Christmas, if you want to have it, or happy Hanukkah, if that is yours, or a great flying spaghetti monster gathering. However you spend your days, think about Santa´s little elves at Amazon, FedEx or DHL and about the massive infrastructural work necessary to let you have some Eggnog, Chestnuts or that box of Breaking Bad episodes that you need for the upcoming festivities. See you all next year! Where’s the fun in infrastructure studies? While this edited book came out in 2003, I only just learned about it today. The Infrastructure of Play is a book about building tourist locations in cities or “tourist friendly cities”. The editor is Judd, who also co-edited the The Tourist City in 1999. As cities become places to play, the authors show, tourism recasts their spatial form. In some cities, separate spaces devoted to tourism and leisure are carved out. Other cities more readily absorb tourists into daily urban life, though even these cities undergo transformation of their character. You see the tension!? As the city recasts its form, planners must balance changing the city system enough to attract tourists but not so much that that which attracts tourists to the city (especially historical elements/places) is/are marred. Still, the newer book is all about North American cities, so this tension (given that US citites are just not that old) cannot be fully developed (in my opinion). In a final comment, another issue that struck me while review these titles: they were about people having fun … and upon a little refelction, why is it that so little research on infrastructure is about fun? Want free internet and have a functioning water/sewer line? 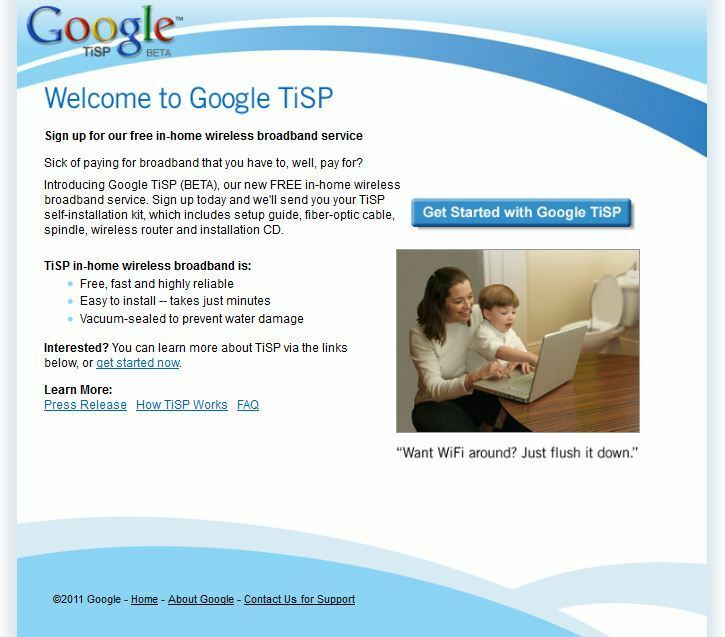 Ladies and gentlemen, Google TiSP has a solution — check it out here. *part of an ongoing series of Google hoaxes.